Flying can be an undesirable event, especially if you have to fly regularly for business. Waking up early, getting everything together, making the trip to the airport and getting through the terminal can be a painful experience. And to top it off, you have to sit on a plane for an extended period of time, often without anything to do. Entrepreneurs, however, see flying differently. They see flying as an opportunity. Instead of dreading the entire process, they accept it and figure out ways to stay productive while en route to their destination. Below, I have listed several things entrepreneurs do on flights to stay productive. Try them out, and tweak them for yourself to see what works best for you. 1. Read a book about your industry. 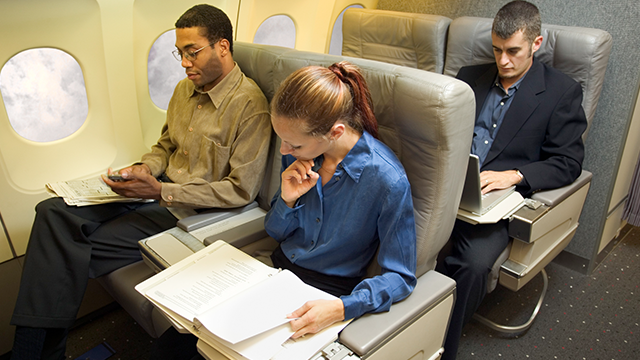 Reading a book or a magazine on a flight is one of the most common ways to stay productive. Most entrepreneurs who travel will use this time to read a book about their specific industry or read about something they are trying to implement into their own business. Use this time wisely, and pick out a book that you feel will help you grow, whether in your personal life or in your business. 2. Clean out the clutter on your devices. We all have clutter on our laptops and mobile devices that just doesn’t need to be there, but we hardly ever take the time to do anything about it. The next time you have to fly, use some of that time to declutter your devices. For me, I start by cleaning out my emails – deleting junk emails, putting important emails into folders, and cleaning out old emails that were just taking up space. You can even take it a step further by replying back to all the emails that need your attention. Save them as drafts so as soon as you get internet connection, all you have to do is hit send. You could also start cleaning out the unwanted pictures or documents you have stored on your device. Create space for more important things to come. Writing out your goals can be done anywhere, but what better time than when you are on a quiet flight? This is where you might have some downtime to sit and actually think about the goals you want to set and how you can make a plan to accomplish those goals. If you have already written your goals out, take them on the plane with you, and start writing smaller goals under each big goal. After all, how do you know what you want if you can’t even write it down on a piece of paper? 4. Make a game plan for when you land. Creating a game plan for when you land is important if you want to grow your network or try to grow your business. If you have meetings planned for when you arrive, think about how you can provide more value to those meetings. If you have some free time, plan out how you can make good use of your time. Who can you call that you’ve been wanting to reconnect with? Go through your phone or emails and see who you’ve been meaning to reach out to but haven’t had the time. Always look for opportunities, and make the most of it. 5. Use the downtime to create content. As an entrepreneur, creating content for your business is paramount. Whether you’re on a short or long flight, you can always use this time to create content for your brand. Create ideas for articles you want to write for your blog, website or other online publications. You can also use this time to edit your videos or recordings. Creating fresh content that is valuable will keep your readers and customers coming back for more, so use some of this time for content creation. 6. Network on the plane. Networking with people on an airplane is probably one of the most overlooked ways to find opportunities. Networking doesn’t mean being the annoying salesman on the plane who is handing out business cards to everyone. Networking is simply creating conversation with people who are enjoyable to talk to. You never know who you could strike up a conversation with. Maybe it's the CEO of a company who ends up wanting you to come train his employees, or it could be someone who turns into a great customer of yours. Even if they were to just become a good friend of yours, it’s still a win. Don’t be afraid to talk to people on an airplane. Most people actually enjoy the conversation. Flying can be undesirable at times, but if you learn to look at flying from a different perspective, you can make it quite enjoyable and very productive. Next time you’re on an airplane, think about the things that you can get done that you normally don’t have time for.